The gray wood and stone colonial house at 805 Cedar Road features 6,900 square feet of living space and surprise features. The town of Fairfield offers waterfront living on various bodies of water, from Long Island Sound and Lake Mohegan to Mill River, Samp Mortar and Hemlock reservoirs. Not every waterway has a name, but life along it is still enjoyable. The nameless pond behind the gray wood and stone colonial house at 805 Cedar Road provides relaxing water views, opportunities for birdwatching, and a place for ice skating in winter months. Water views are found inside the house as well. The den features a wall with a built-in aquarium. That’s just the first of several surprises found throughout this house, which has almost 7,000 square feet of living space. 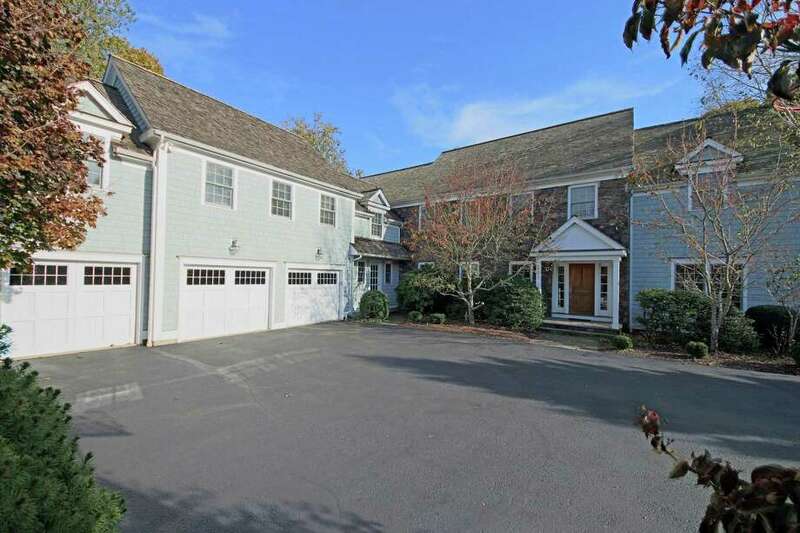 This center hall colonial sits on a largely level property of just over one acre, adjacent to Aspetuck Land Trust protected open space, in the Southport section of Fairfield, north of Post Road (Route 1). It is convenient to the downtown area and train, as well as Westport retail shops and restaurants on the east side of that town. Although it was built in 2001, this house lives more like a house that was more recently constructed rather than a traditional residence, perhaps owing to the skill of Fairfield-based Tallman Segerson Builders, headed by Jeff Tallman. His is a high-end custom building company with more than 40 years’ experience in Fairfield County and elsewhere. The stone and wood shingle house has 14 spacious rooms, tall ceilings, and an open floor plan, the flow of which encourages everyday living and entertaining, as well as indoor and outdoor living. It is the first house on the left of a private driveway, which is shared by a second house. Ample parking is found in the forecourt in front of the L-shaped house. At the covered front entrance the door is flanked by sidelights. The door opens into the front-to-back true center hall, the back of which has French doors to the sizable slate patio — where there is a hot tub, and the backyard. In the formal living room, there is a fireplace with a granite surround and detailed mantel. A short vestibule leads from the living room into the den, which leads into the back of the foyer. The den also accesses a beverage center/wet bar that includes granite counter space, a wine refrigerator, glass-front cabinetry and a door to the patio. The formal dining room has chair railing and wainscoting on the lower walls. Features in the gourmet eat-in kitchen include a center island with a breakfast bar for two, a peninsular counter with a second, longer breakfast bar, and high-end appliances including a six-burner Viking range top and Sub-Zero refrigerator. A greenhouse window over the double sinks provides a sunny place to grow fresh herbs with which to prepare culinary feasts. The two-story family room is quite large and features a stone fireplace, skylights, two walls of built-in cabinetry and bookshelves, and French doors to the patio. A loft space looks down into the family room from the second floor. A rear staircase leads to this loft, which has flexible use as a playroom, homework station, or teenage hang-out. This is a unique space, and one of the other surprises in this house. This whole wing is designed to give privacy to those who occupy the two bedrooms at this end of the second floor. Both bedrooms, off the loft space, have their own full baths and a second room. One is used as an office or study space and the other serves as a gym. In all, there are five bedrooms on the second floor, all en suite. In the master bedroom suite there is a vaulted ceiling, sitting area, skylights, dressing room, walk-in closet, and marble bath with a jetted tub, shower, and double vanity. The full, partially finished walk-out lower level has an additional 1,000 square feet including a gym and ample space for a game room and a media room. There is also an office and full bath on this level, which means this space could be an in-law or au pair suite. For more information or to set up an appointment to see the house contact Victoria Fingelly and Paul Triantafel of William Pitt Sotheby’s International Realty; Fingelly at 203-610-0647 or Victoria.fingelly@williampitt.com, and Triantafel at 203-209-0576 or ptrianafel@wpsir.com.